Should I configure OpenElec/LibreElec using device-tree overlay? Alle newer versions of OpenElec (starting with version 6) and all LibreElec versions use the device-tree method to configure the board. If you have already flashed the EEPROM of your DAC+ Standard/Pro or Digi+, the card will be automatically detected and you only have to configure it in the settings menu. Login to your OpenElec system using ssh. When you first boot you should enable SSH when the Welcome to OpenElec wizard is displayed. You can enable SSH, later, via the OpenElec settings. Edit the configuration text file /flash/config.txt using an available text editor, such as nano or vi. Add the following lines,depending on the type of sound card, to config.txt. Save the changes to config.txt and then reboot your OpenElec machine. Once rebooted, navigate the OpenElec menu to System → Settings to show the Change Your Settings panel. 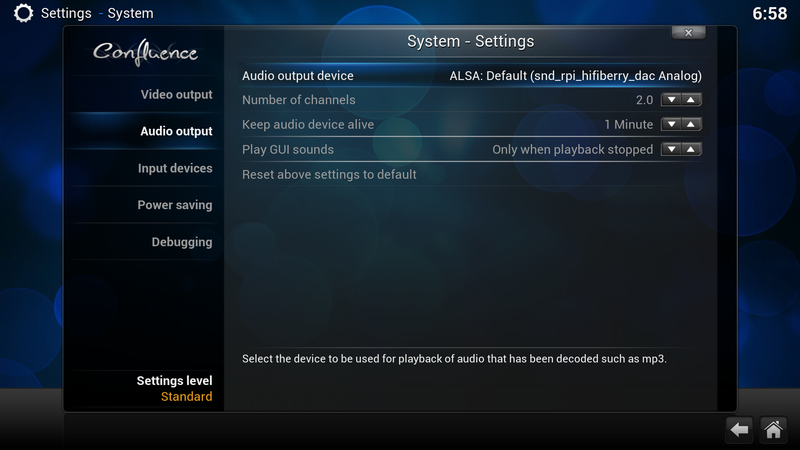 Select the System submenu followed by the Audio output page. From the Audio output device select the ALSA enabled HiFiBerry sound card. All sound will now go to the HiFiBerry sound card’s output. You may want to experiment with the percentage volume in order to tune it to your desired preference. Is this a line to add to the /flash/config.txt file? Add this line after the dtoverlay-etc?